Andy Wolber has been writing, teaching, and helping people understand technology for 15+ years. His focus is G Suite, iOS, and nonprofit sector apps. Apple ships your iPad Pro with the wallpaper and lock screen image set to an image they select, which varies by device and iOS operating system version. For the iPad Pro, you will likely want to select a landscape-oriented image. 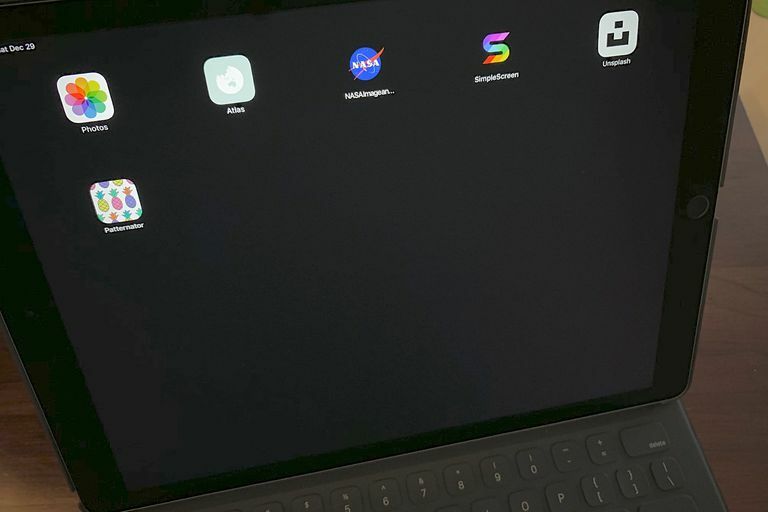 That’s especially true if you use the iPad Pro with the Smart Keyboard attached, since you’ll often view your device in landscape orientation. While there are plenty of iOS apps that help you find photos you can use as iPad wallpaper, the six sources below may be all that most people need. Any image you’ve captured or created that means something to you will make a fantastic lock screen or home screen image. You have complete control over images you make! Keyword search for images doesn't always return results you expect. Many people like to look at a photo of friends, family members, pets, or a favorite place on an iPad lock screen or home screen. That makes sense, as the most personal wallpaper may be an image you capture or create. So, open the Apple Photos app and browse through your photo albums to select an image that means something to you, then set it as your wallpaper. Easy to create a moderately abstract 2D or 3D map wallpaper. Most cities offer a distinct view. No option to show location names. Can't display satellite images of sites. Atlas lets you create an image of a map of any location on the planet. First, find a location by name or auto-locate your current position with GPS. Next, choose from several different stylized color-schemes to customize the look of the map. A one-time fee of $1.99 gives you to ability to create a custom style, where you can select the map color for land, water, roads, and parks. Stunning images of space and Earth. Nearly all images free for personal use. May take a few tries to determine the appropriate size to select when downloading an image. Some NASA images can be extremely large. NASA provides a searchable site for photos from space and space-related images. Tap “Most Popular” to see some of the most iconic images, including photos of Mars, the entire planet Earth, or images from the moon landing. When you download an image, select from several sizes (e.g., small, medium, large, or original resolution). Almost all NASA content is not copyrighted and is available free for personal, non-commercial use. Easy to select background, adjust, and edit text. Fairly basic for a paid app. Very limited number of text box display options. Can create similar images with free presentation tools. SimpleScreen ($0.99) helps you create a wallpaper that includes your name and contact instructions that display on your lock screen. This may be helpful in the event you misplace your iPad Pro. A few of the options allow you offer a reward for the return of the device. Keyword search typically returns a solid set of relevant photos. No way to restrict results by image resolution or orientation. May need time to scroll through search results. Open Unsplash, type a search term, then browse through photos. When you find an image you like, tap it to see it full-screen, then tap the down arrow in the lower-right corner of your screen to save the image to your iPad. The Unsplash license lets your use any of these images for free. Option to buy a t-shirt, phone case, pillow, or tote bag with your pattern on it. Easy to create a repeating pattern. Monthly $1.99 fee to remove watermark and export high definition image may be more than some people want to pay for a wallpaper app. Can create some very visually unappealing combinations. The app does exactly what the name suggests. It lets you select an image (or images) and repeat it in a pattern. You can adjust the scale, spacing, and angle of the object, in addition to other adjustments. The free version lets you export a standard resolution image with “Patternator” overlaid in the lower right corner.